Smoke and CO2 Detectors- Understanding Their Importance! Smoke and Carbon Monoxide Detectors are devices which will save you, your family and your home. It’s purpose is to detect any traces of smoke or carbon monoxide and alert you, with that extremely high pitched screech! These devices with alert you at ANY given time of the day. Recent studies have shown us that the most common fatalities caused by fire have been early in the morning, or late at night, while we are in a deep sleep. The poisonous gases that come from fires, such as carbon monoxide can in a short time frame affect a person’s ability to focus, causing them to become confused and disoriented. 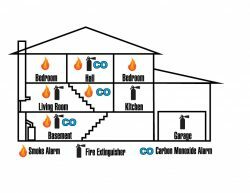 It is extremely important to have multiple properly installed, working smoke/Co Detectors(see above diagram). It is the LAW, and SAVES LIVES. Ensure you have at minimum one smoke/Co detector on each floor of your home and that are placed in appropriate locations. Have your Smoke/CO detectors hard wired by a certified electrician. This then allows the devices to still operate properly in the event it detects smoke, and your batteries have died, Although we still recommend you change the batteries on a yearly basis as a back up. Clean your devices by either vacuuming or dusting them. By keeping the sensors clean allows for most accurate detection. Test your devices on a regular basis, we recommend monthly. 1st test- Press the test button to ensure power is still running to your device. 2nd test- Blow out a candle near the detector to assure the alarm goes off when smoke is detected. The alarm should be going off within 20 seconds of blowing out the candle. To turn alarm off, simply wave a towel or fan the smoke away. If you require assistance with inspection, repair, replacement, or installation of a smoke/Co detector in your home, please call Proline Electric. One of our many certified electricians will conduct a thorough fire alarm safety check to assure your device is operating properly. We are here with your Safety as our #1 priority, giving you peace of mind you, your family and home is protected. Proline Wins Best of Homestars 2017! Top 3 Question's Home Owners Want Answered. Keeping warm but safe with Electric Blankets!